401. 800 point armies normally have from 9 to 15 BGs though some can get to around 20. Choice of BG size within the allowable ranges should depend on points available and the role of the BG in your battle plan. More BGs means more organizational flexibility and more tactical articulation for the army, particularly useful for drilled troops who are able to take full advantage of it. Having more BGs allows more complex manoeuvring and lets clever players do clever things. It can reduce the relative overall impact of bad luck or a mistake â€“ but also affords more opportunities to make mistakes. Having more but smaller BGs means the army can absorb more attrition points without breaking, so having a number of small cheap â€œfillerâ€ BGs that avoid being broken in combat can allow heavier losses among the stronger engaged BGs. Mobs or LF are the cheapest filler BGs; 4-LH BGs cost more but with their mobility are more likely to contribute to the battle without risking survival. BGs assigned by doctrine to the second line also tend to be smaller than others. Mixing BG sizes of the same troop type or similar can provide tactical flexibility. The disadvantage of smaller BGs is that fewer shooting hits can trigger a 1-hit-per-3 bases Cohesion Test and if 4-strong will suffer the -1 modifier for 25% loss after losing just one base and unless autobreak after 2 unless Superior. Having numerous manoeuvrable BGs may also help in tournaments since at best they are likely to have unpinned BGs free and able to work flanks and at worst they are likely to be able delay defeat and mitigate points lost when time expires. 402. Big BGs are less mobile when changing direction, but they shrug off Cohesion Tests from shooting more easily (helpful when of low quality), last longer when taking damage, and have more bases that can enjoy reroll benefits from having a Commander in the front rank. Armoured, Superior and Elite fighting troops can be safe and effective in smaller BGs than average, while Poor and Undrilled troops tend to run larger. Note that BGs of 6 bases can easily deploy from column or 2-wide and wheel more quickly than 8s, while both 6s and 8s take 25% loss at 2 bases, and 6s test at 2 shooting hits while 8s test at 3 shooting hits. 403. Only the first 3 ranks count for â€œ1 perâ€ loss rates in Cohesion Tests (only the first rank for Elephants and Battle Wagons). Most troops fight in 2 ranks; some such as Knights, Chariots or Elephants just 1. Thickening to 3 ranks or more can be useful to anticipate losses in a hard frontal fight between lines of battle. Thinning 2-rank troops to 1 rank should be reserved for situations where frontage is more important than resisting power, where troop quality still gives them the advantage against more numerous opponents even in one rank, or where a sacrificial BG is used to tie up and absorb damage from multiple opponents to allow freedom of action elsewhere. 405. For Drilled fighting foot, 4 bases is common for quality foot, 6s or 8s for Average, although some strategies take as many small BGs as possible. For Undrilled foot, 6 is small (but fairly common for MF terrain fighting troops), 8 is typical, 10 large, and 12 unwieldy (due to frontage and not much better in terms of loss percentage effects than 10s). The exception is Pikemen, which are normally in 8s or 12s to fight 4 ranks deep, although having 10 and deploying in two 5-deep files gives added durability as lost bases donâ€™t automatically mean lost POAs. 410. 6-LH BGs are less nimble and harder to bring to bear than 4s, and having more smaller LH BGs can be very useful in outmanoeuvring the enemy and are still able to concentrate firepower and split enemy shooting. That said, 6 LH have an edge against 4 opposing LH without needing a POA, throw 3 shooting dice rather than 2, suffer the 50% shooting hits CT modifier on 3 hits rather than 2, and wonâ€™t take 25% losses with a single base lost â€“ all advantages if you expect to engage enemy LH in combat or face an enemy with strong shooting of their own. 411. Light Foot with Javelin and Light Spear or Slings with 4 bases may find getting close enough to contribute to shooting too risky but are cost effective for BG count (especially if Poor) and for screening and delaying enemy. LF shooters in 6s are generally favored as cheaper and more manoeuvrable than 8s while still usefully throwing 3 shooting dice; 8s often end up splitting their shooting across two targets anyway â€“ smaller BGs are easier to point at the desired target. However, leaving the Javelinmen with Light Spear in 8s will make them more effective against other LF and can make even lone LH BGs wary of close combat. (The same size argument for size applies to using Javelin/Light Spear LH in 6s to chase off smaller LH BGs.) However, having an equal or greater number of BGs than the opposition can take priority over size where there is room to manoeuvre. 415. The likelihood that a Fortified Camp will hold out for a few turns makes it easier to ignore LH behind your lines who are seeking those 2 Attrition Points, or gives time to get reinforcements there. Note also that the Camp need not be on the baseline and can be in terrain. A Fortified Camp on or near the baseline can be used as the pivot point for an army wheel strategy intended to turn the battle 90 degrees in order to shorten the battle front. A least one BG will be close enough to the Camp to chase off intruding Skirmishers if needed. 420. Donâ€™t buy more bases or upgrades than you need for a BG to fill its role. 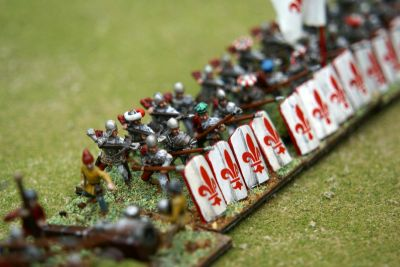 Missile troops can skimp on armour, as can dedicated flank chargers; Undrilled troops are for fighting, not clever manoeuvre; and superfluous quality or capabilities wastes a lot of points (Poor Skirmishers are recommended as good value for BG count and in roles where they wonâ€™t get hurt). 421. BGs with only 2 bases cannot afford to lose a base and auto-break so should be shielded from shooting and supported on both flanks in close combat to prevent overlaps. This is particularly the case if they are horse or foot, since they lack the Death Roll bonus of Elephants, Battle Wagons and Artillery.